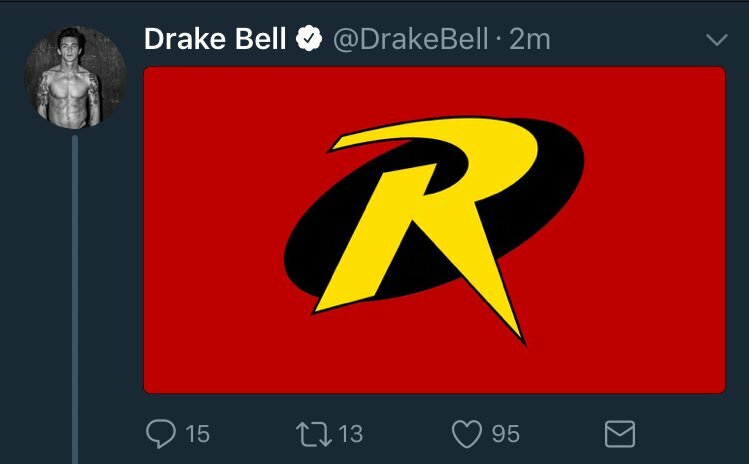 Is Drake Bell Teasing A Role As Robin In The DCEU? Are we about to see Robin, the Boy Wonder, appear in the DCEU? 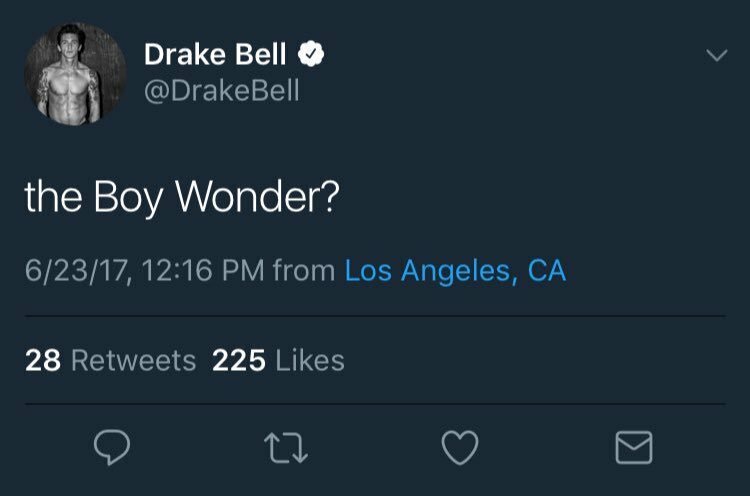 Unless actor Drake Bell’s just trolling his fans – which, in all honesty, he probably is – then yes, it seems so. Earlier today, a cryptic Tweet was sent out by the Ultimate Spider-Man star that’s put everyone into a bit of a frenzy. It’s since been taken down – which has only intensified the speculation – but one user managed to grab a screenshot of it. 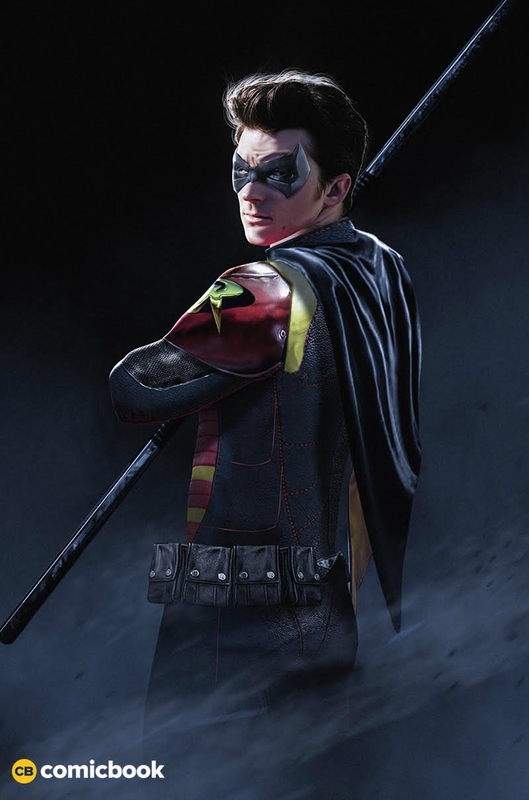 Though Bell didn’t explicitly say he was playing the character, the Tweet carried the caption “the Boy Wonder?” and was followed by a photo of Robin’s signature logo – the one often associated with the Tim Drake version. Is Bell simply telling us, and whoever else is watching his Twitter account, that he’s interested in the part, or is there something else going on here? Perhaps he’s teasing a role in an animated DC effort, rather than in the DCEU? It’s tough to say right now, as we see this sort of thing all the time on social media – remember the Josh Gad/Penguin debacle? Regardless, fan artist extraordinaire Boss Logic has already joined in on the fun, providing a pretty awesome design (seen below) of what Bell could look like as the fan-favorite character. As per usual, it’s a solid mock up of how the actor might appear should this bit of casting end up happening – which, again, it probably isn’t. We could be wrong, of course, and the fact that Bell deleted the Tweet shortly after it went up is definitely interesting, but we’ve just been fooled by this sort of thing far too many times now to take it as any kind of confirmation. We’ll be sure to let you know if anything more comes out of this, but in the meantime, check out Boss Logic’s design of Drake Bell as the Boy Wonder below and be sure to leave us a comment with your thoughts on the actor’s Tweet. Is he set to play Robin in the DCEU, or is Bell just having some fun with his fans? Sound off in the usual place!